The herb Delphinium Staphisagria, with mauve-blue to blue flowers grows to just over one metre tall and is native to Asia and the southern regions of Europe. It is also known as Larkspur or Lice-bane because of its herbal use in killing body lice. 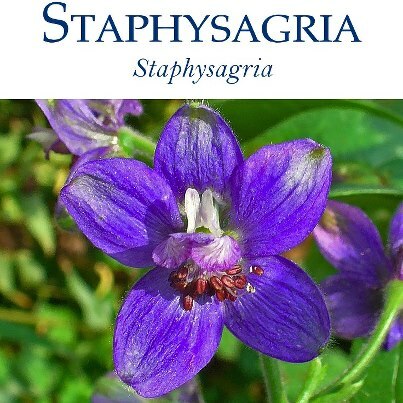 The homeopathic remedy, Staphisagria, is prepared from the seeds of the plant, and suits those who are mild, submissive and suppress their emotions. Confrontation is difficult but when they do become angry they are likely to tremble, choke on swallowing, stammer, or throw things. Someone in a Staphisagria state feels worse after an afternoon nap, is prone to sexual fantasies, cystitis and styes. Staphisagria is one of the best remedies for incised wounds (wounds with straight, clean edges). It stimulates healing and relieves pain, even in old scars of incised wounds. When the remedy matches the symptoms, Staphisagria has the ability to treat conditions such as cerebrovascular accidents, chorea, connective tissue disorders, cystitis, depression, eneuresis, headaches, haemorrhoids, insomnia, multiple sclerosis, orchitis, post-surgical pain, psoriasis, strabismus, styes, and tics. Want of memory and heavy weight between eyes. Child throws or pushes things away indignantly. Indifference, low-spirited, dulness of mind ; after onanism. Hypochondriacal, apathetic, with weak memory ; caused by unmerited insults ; sexual excesses, or by persistently dwelling on sexual subjects. Very sensitive to least impression ; the least word that seems wrong, hurts her. Fretful peevishness, with excessive ill humor. Great indignation about things done by others or by himself ; grieves about the consequences. Ailments from indignation with vexation, or reserved displeasure. Stiffness and sensation of fatigue in all the joints, on motion. Bones, especially those of the fingers, imperfectly developed. Swelling and suppuration of bones and of periosteum ; shooting, tearing, or boring pains.